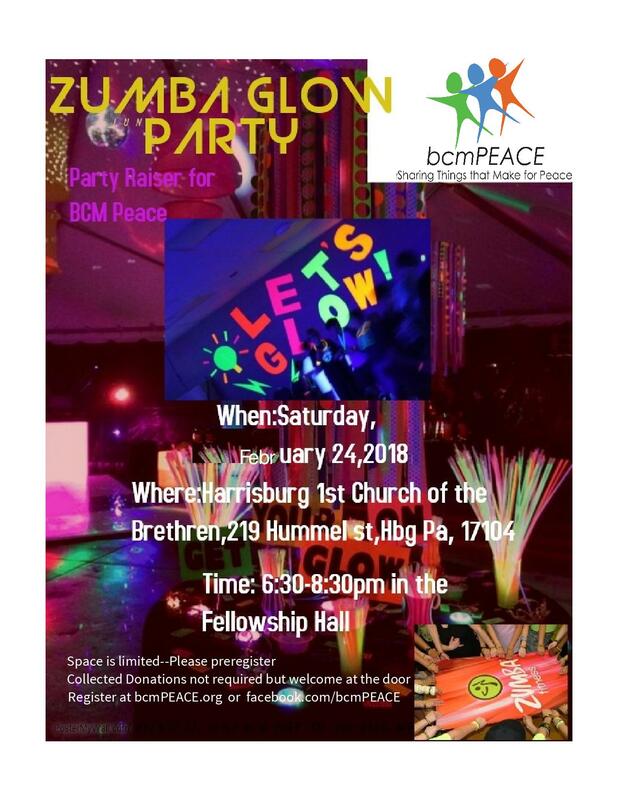 Join bcmPEACE for our Zumbo Glow Fitness Party on Saturday, February 24, 2018, 6:30-8:30pm at Harrisburg First Church of the Brethren, 219 Hummel St., Harrisburg, PA 17104. Black Lights illuminate glow-in-the-dark clothes and accessories. We’ll have body paint, glow sticks and necklaces available for free at the event. They’ll be a cool photo booth with props. Our Zumba Certified Lead Instructors are Jeff Still and Natausha Bulgrien. This is a fundraiser so please collect sponsorships and bring them with your personal donation to the event. Our goal for the event is to raise $5,000. People can give to to bcmPEACE online in your name via secure Paypal on this home webpage. If you plan to attend please help us in our planning by emailing your name to zumbaglownow@gmail.com or leaving a message at 717-461-2951. Download the Zumba Donations Form to keep track of the donations you collect. Download the Zumba Poster to share with others via email or on social media. This entry was posted in Event and tagged bcmPEACE, brethren community ministries, fundraiser, Zumba, Zumba Glow Fitness Party on February 4, 2018 by bcm2010.